Statisticians Mirko Jalava (FIN) and A. Lennart Julin (SWE) continue their ‘End of Season’ event category reviews, which cover all Athletics disciplines, highlighting the best performances which have taken place across our sport in 2012, with ROAD RUNNING AND RACE WALKS. This year was another extraordinary 12 months for the marathon. There may have been no world record, but the picture in the event has really changed a lot in the last eight years. In 2012, the 20th best performer in the world list ran 2:05:42 while in 2004 Kenya’s Felix Limo led the way with a world-leading time that year of 2:06:14. A quick look at the 20th best performer shows how quickly the depth in marathon running has improved. There were several marathons where Patrick Makau’s world record 2:03:38 from Berlin in 2011 was threatened. Berlin was once more the fastest marathon in the world with a sprint finish finale and the two fastest times of the year. Kenya’s 31-year-old Geoffrey Mutai, who has run the fastest marathon of all-time in Boston 2011 when he clocked 2:03:02 on the downhill course, ran a 2:04:15 for the win while his 28-year-old compatriot Dennis Kimetto recorded the fastest ever marathon debut in 2:04:16 for the second place. Ethiopia’s 21-year-old Ayele Abshero was the first to run a fast time in 2012, winning the Dubai Marathon in January in 2:04:23 on his debut. His compatriot Tsegaye Kebede was the winner in Chicago in October, clocking 2:04:38, while Kenya’s Wilson Kipsang came home in front at London Marathon in April in 2:04:44. To complete the historic collection of five marathons in the same calendar year with winning times under 2:05, Ethiopia’s Yemane Adhane won in Rotterdam in April in 2:04:48. Even if it was not as fast as those races already mentioned, there was also the London 2012 Olympic Games marathon in August. 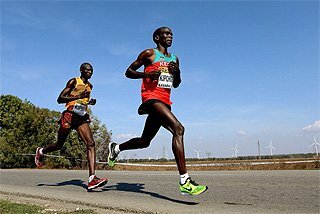 On a different circuit to the London Marathon four months earlier, several big names were running and one of the biggest favourites was Wilson Kipsang, who had won in the same city just a few months before. 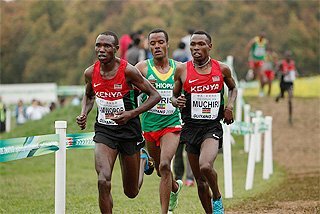 Alongside Kipsang, Abshero was in the Games race as well but, like usual for major championship marathons, tactically it was expected to be like the so-called big city marathons. The destination of the three medals was decided well before the end of the race with a trio of runners building up a considerable lead. Kipsang was there, along with his countryman Abel Kirui, the winner over the classic distance at the last two editions of the World Championships and surprisingly the Ugandan record holder Stephen Kiprotich was up there as well, running only his fourth race in the event. However, it was Kiprotich who was the one to break away for the win, moving away from his rivals with just over three miles to go before crossing the line in 2:08:01. He became only Uganda’s second Olympic gold medallist ever, and first in 40 years since John Akii-Bua’s 400m hurdles win in 1972. Kirui was second in 2:08:27 for his third straight major championships medal while Kipsang came home third in 2:09:37. Kenya is the clear number one nation overall at this event with an astonishing 58 runners in the 2012 world top 100. Ethiopia is in second with 31 men in that list, leaving the rest of the world with a mere 11 places. In this event, Russia has been the best country for a number of years, but China has been looking promising for a while despite their walkers not doing well at major championships other than the IAAF World Race Walking Cup. However, all that changed at the Olympic Games where the race, in great surroundings on the Mall, was a fast one from the start. 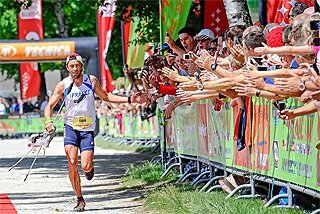 After Russia’s Vladimir Kanaykin was disqualified just after 16km, there were four athletes left in the leading pack: China’s Wang Zhen and Chen Ding, Russia’s Valery Borchin, who had won the last three major championships, and a surprise name from Guatemala, Erick Barrondo. With everyone waiting for either Borchin or Wang to make a move, it was actually Chen who broke away on the penultimate 2km lap, followed initially by Borchin, who was to dramatically collapse one kilometre from home and fail to finish. Chen won a historic gold for China, their first Olympic medal in this event, and he was still 19 years old, turning just 20 the day after the race. 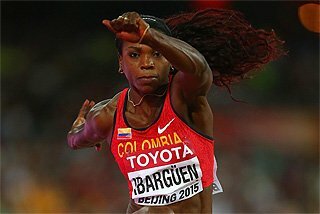 Barrondo guaranteed himself hero status in his home country when he got his country’s first Olympic medal in any sport with the silver medal, hanging on despite having two warnings, while Wang grabbed the bronze and another Chinese walker Cai Zelin came home in fourth place. The Russians had their usual fast domestic race, their winter championship, in February. With their number one force, Borchin, not in action yet, Andrey Ruzavin set a fast personal best of 1:17:47 for the win. China, however, made an opening statement of their own in local surroundings at the IAAF Race Walking Challenge race in Taicang. Wang recorded a 1:17:36 Asian record for the win and was followed home by Chen in second with a 1:17:40 personal best. Wang then went on to win at the World Cup in May on Russia soil in Saransk, crossing the line in 1:19:13, with the Russian pair of Andrey Krivov and Kanaykin finishing second and third. It is worth noting that Chen and Borchin, the winner of the last two World titles in 2009 and 2011 and the reigning Olympic champion, could only finish ninth and 10th respectively in Saransk. China is the best country with 20 athletes in the world top 100 at this event with Russia second with 11 walkers and Poland third with nine. 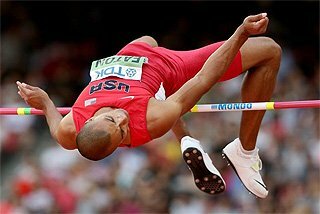 This event was predictably thin in terms of depth of performances with a number of the top men having their only outing of the season over this distance at the Olympic Games. There was really only one major race before London, at the IAAF World Race Walking Cup in Saransk in May, where the Russians were well in control. The Russian duo of Sergey Kirdyapkin and Igor Yerokhin were together until almost the finish line, with Kirdyapkin setting a world-leading time of 3:38:08, which also equalled his personal, best for the win. 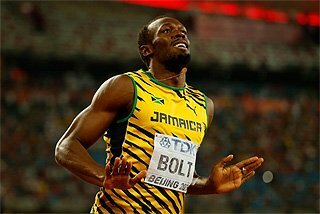 It was exactly the same time that won him the gold medal at the 2005 World Championships. Yerokhin made an impressive debut in 3:38:10 for the second place while 2008 Olympic Games silver medallist Jared Tallent (AUS) was third in 3:40:32 and China’s Si Tianfeng fourth in 3:43:05. Olympic Games 50km races are usually fast and this was no different. Several athletes made surges early in the race to ensure the pace was quick from the start, but then fell back and did not finish the race: including Japan’s Yuki Yamazaki and France’s two-time European champion Yohann Diniz. At 40km, Kirdyapkin held a one second lead over Si and another Russian Sergey Bakulin and the 32-year-old carried on pressing his advantage before crossing the line in 3:35:59, which took more than a minute off the Olympic record. Tallent had a great finish over the final 10km to win his second straight Olympic silver medal at this distance in 3:36:53 while Si was third in 3:37:16, the first Chinese medal at the Olympics in this event..
All three medallists got personal bests while Ireland’s Robert Heffernan had the race of his life and briefly seemed to be catching Si but had to settle for just being out of the medals with a 3:37:54 national record for fourth place. The 10 best results of the year were achieved either at the Olympics or the World Cup. 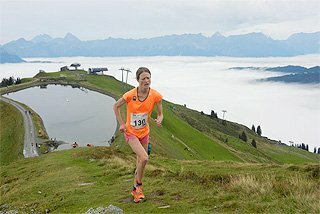 China tops this walking event as well with 12 athletes in the world top 100 with Russia a close second with 11 men in the list. Poland is third with seven. This year was just the best year ever for this event in terms of depth, just like 2011 was the best ever only one year ago. Look at how the event has progressed in the last four years. In 2008, there was just one runner under 2:20, followed by two years when nobody broke that barrier; but in 2012, the number of sub-2:20 runners were no less than six. There were nine sub-2:24 runners in 2008 while, this year, there were 33. This kind of progress is today absolutely unique to the marathon among the long distance events, in the stadium events the general picture is that the status quo is being maintained. Among all the other factors, possibly the most important is that if you are a distance running talent, then your earning potential is much greater on the roads than on the track. 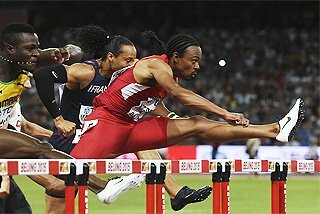 In the on-going battle for the top spot at major championships, Kenya held the advantage in 2011 when they swept the podium at the IAAF World Championships and had the winner at major big city races like London, Berlin, Paris, Rotterdam and Boston. However, this year, Ethiopia struck back in impressive fashion. They had the Olympic champion in Tiki Gelana and they were victorious a number of top international races: Berlin, Chicago, Frankfurt, Rotterdam (where Gelana ran a national record 2:18:58), Dubai, Paris, Amsterdam, Shanghai and Seoul to name just the major ones. Kenya’s main response was at the London Marathon in April, which they turned into the Kenyan Olympic trials by having the top five finishers. The Kenyan contingent were headed by Mary Keitany, whose 2:18:37 national record would remain the fastest time in the world in 2012. Three months later in the same city, but on a different course, the best the Kenyans could muster was a silver medal from Priscah Jeptoo, with Keitany fourth behind the Russian surprise Tatyana Arkhipova. The first four finishers were together with 2km to go but a powerful finish by Gelana took her to the gold medal. Gelana came through the line in an Olympic record 2:23:07 with Jeptoo five seconds in arrears and Arkhipova, perhaps better known as better known as Tatyana Petrova who was second in the 2007 World Championships 3000m steeplechase, third in a personal best 2:23:29. No fewer than a record 29 women broke 2:30, compared to the previous record of 21 in the 2011 London Marathon. The obvious question for the near future is will the revolution of recent years mean that 2013 will be even better - and will Paula Radcliffe’s World record 2:15:25 from the 2003 London Marathon come under some pressure - or will things will slow down? 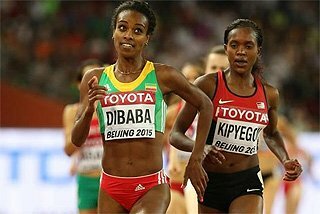 Ethiopia’s Tirunesh Dibaba who, after winning her second Olympic Games 10000m title, has said that she intends to move her focus to the roads and maybe the woman to challenge Radcliffe’s awe-inspiring mark; or could the likes of Gelana and Keitany (or maybe even the currently injured Aselefech Mergia who won in Dubai this year in 2:19:31) go even faster? 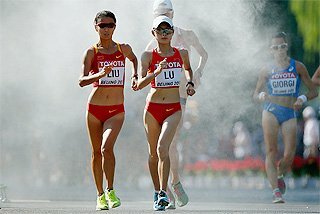 Of all athletics’ disciplines, women’s race walking is the only one dominated to a big extent by one single nation, Russia, and that situation continued in 2012. Out of the last nine global titles at stake, not counting the IAAF World Race Walking Cup, all but one has ended up in a Russian’s possession. The main recent contributor to Russia’s gold reserves has been Olga Kaniskina who won all four gold medals on offer at the IAAF World Championships and Olympic Games between 2007 and 2011; and she was so close to making it five straight as she lost by just seven seconds at the London 2012 Olympics Games to her prodigious young compatriot Yelena Lashmanova. At the Olympics, at the 16km mark, with two 2km laps to go, Kaniskina was 24 seconds ahead of Lashmanova and China’s Qieyang Shenjie. 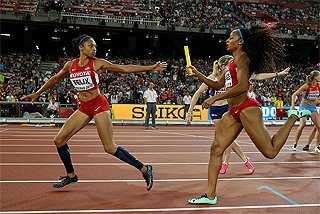 By the bell, Kaniskina’s advantage was still 17 seconds but Lashmanova had judged her effort brilliantly and went past her team mate 100m from the finish to cross the line in a World record 1:25.02 and become the youngest ever Olympic female walking gold medallist. Kaniskina was timed at 1:25:09 while Qieyang never threw in the towel and took the bronze medal in an Asian record 1:25:16. Immediately afterwards, Kaniskina said that she was considering retirement. However, most likely, she will hang on for one more year as the 2013 World Championships will be in Moscow. By contrast to the experienced Kaniskina, the 20-year-old Lashmanova was a newcomer to the 20km distance in 2012. 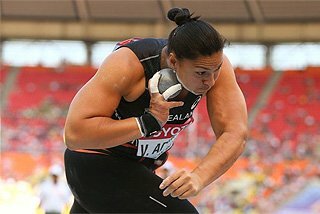 However, after compiling an impressive youth and junior CV - winning at the 2009 IAAF World Youth Championships, 2010 IAAF World Junior Championships and 2011 European Athletics Junior Championships – everyone knew she was clearly a talent worth watching despite her inexperience over the longer distance. She started her career as a senior with second place behind Elmira Alembekova at the Russian Championships in February, clocking 1:26:30 to the winner’s then world-leading 1:25:27. Lashmanova then caused a minor sensation at the IAAF World Race walking Cup in Saransk by convincingly beating Kaniskina in hot conditions, 1:27:38 to 1:28:33. Waiting in the wings is still more Russian talent. At the last three editions of the World Junior Championships, Russia has had both the gold and silver medallists in the 10,000m Race Walk and that was no different this year in Barcelona thanks to Yekaterina Medvedeva and Nadezhda Leontyeva. It is very hard to see how the Russian grip on this event will be seriously challenged within the foreseeable future.